If you do Bonsai or collect ceramics long enough, sooner or later this is going to happen to you. While photographing a rare, one of a kind Suiban from artist Shigeru Fukuda, a stone fell on the suiban, effectively destroying it. Needless to say, I was upset, but hoped I could turn this disaster into something beautiful and interesting, as well as a good article for the blog. Some months ago I received a message on the blog from one “Lakeside Pottery” which specialized in custom pottery and restoration. 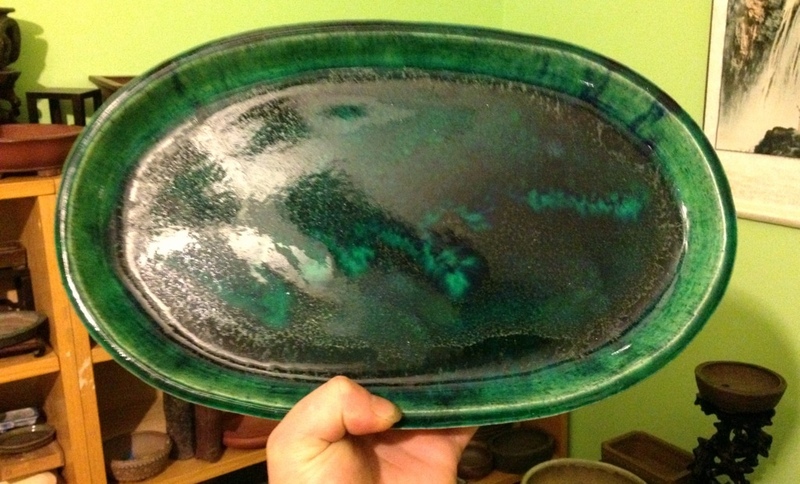 Not one to endorse products or services I haven’t used, I decided to give Lakeside Pottery a try. Before we go into that, how about we take a second for a little history and definition of terms. 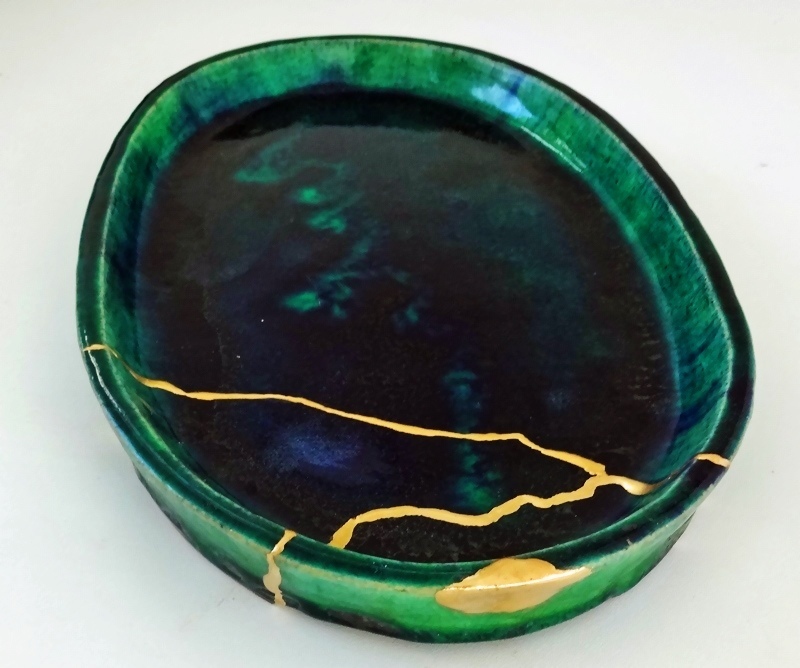 Kintsugi, or Kintsukuroi, means “Golden Repair” or “Golden Joinery”, and, traditionally, is the Japanese art of repairing ceramics with Japanese Lacquer(Toxicodendron sap….volatile stuff. Think Poison Ivy concentrate!) that is then dusted with gold powder. In the best of repairs, this results in pottery that is all the more beautiful for having been broken. The tradition dates back to 15th Century Japan. The possibly apocryphal origin story is that a 15th century Shogun sent a tea bowl back to China for repair, and it was returned with unattractive staples, causing the Shogun to look for Japanese craftsmen who could do better. Now, back to the Suiban. 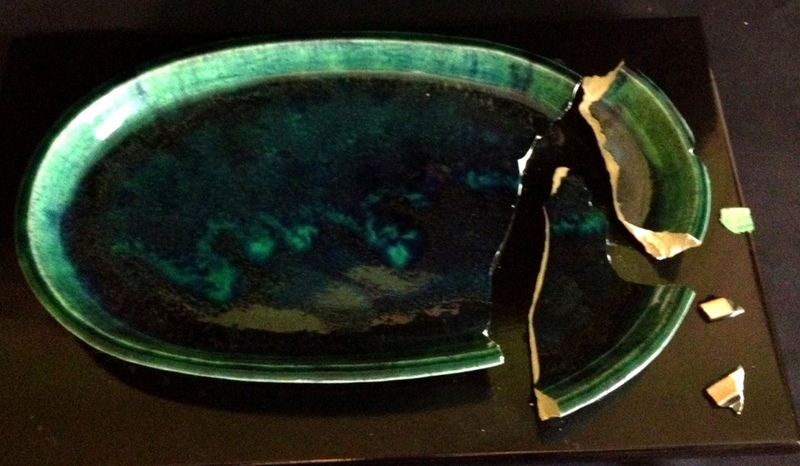 I contacted Lakeside Pottery and contracted them to do this repair. 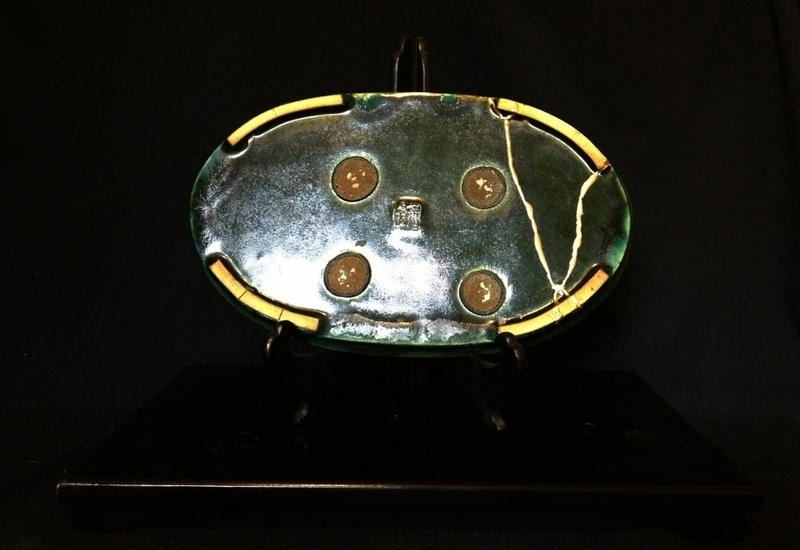 They offer many different styles of repair, and different metals for Kintsugi style repair. I decided to go for a mix of gold and brass, a process developed by and unique to Lakeside Pottery, because I thought this would be option most collectors would go for, as it is much cheaper than 100% gold, and the effects are, to my eye, indistinguishable. 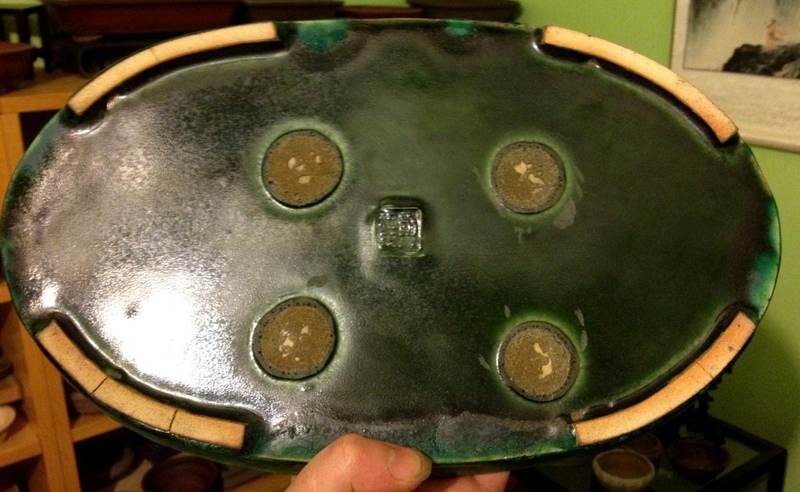 Let me say that this type of repair isn’t what you’re going to want for your low level Tokoname pots, as it isn’t inexpensive, but for real collectors pieces, Japanese and Chinese antique pots, and pieces with sentimental value, the cost is definitely worth it, and is still a fraction of the cost of some these items. 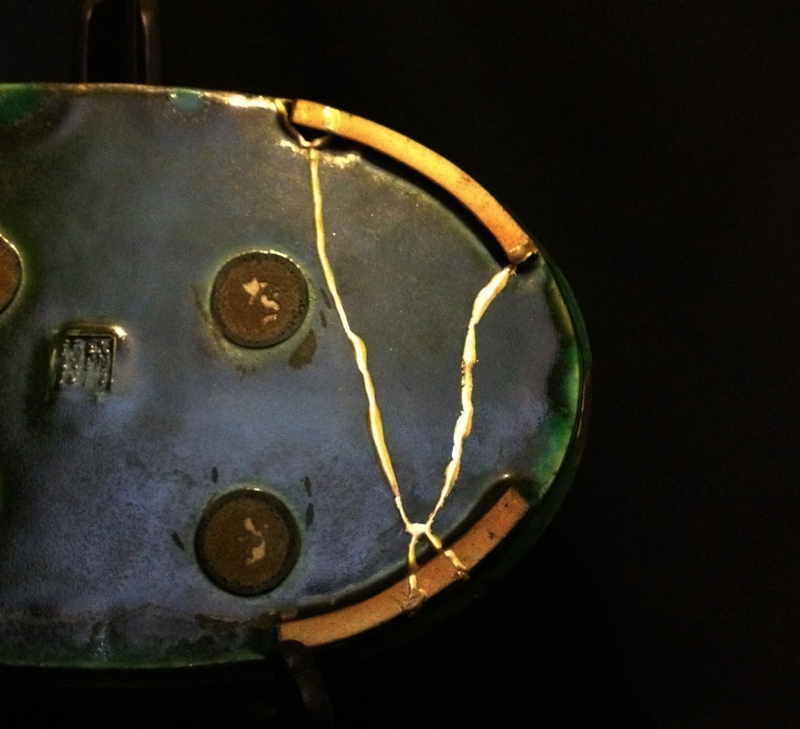 So, let’s take a look at the Lakeside Pottery Repair. I chose the more organic option of repair, where, instead of completely straight lines and thicknesses, the piece, after being fully repaired, is placed on a wheel and spun so the lines come out in varying widths and designs. Given the nature of the piece, and Bushuan pots being famous for unpredictable and organic glazes, I thought this was appropriate. I should also say that it was pleasure talking to Morty of Lakeside Pottery. He has a real passion for ceramics and repair, and freely shares his knowledge of both, something I really appreciate. 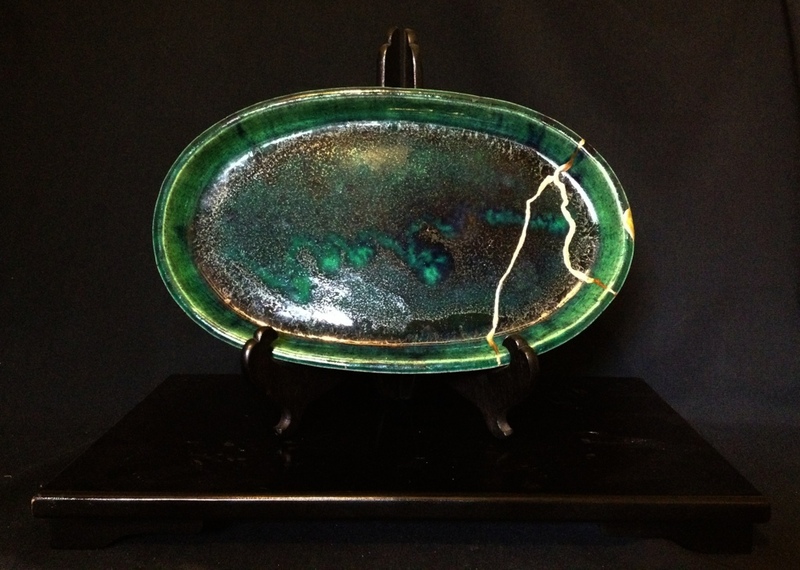 Not only does Lakeside Pottery provide Kintsugi repair services, but you will find tutorials on their website on how to do it yourself, and they also provide classes. I feel that Lakeside Pottery did an absolutely superb job, and as such, fully recommend them for any repairs you may have. While this type of repair isn’t something you can use everyday out on the benches, I think it is fine for containers that will only be used for show, as the repairs are water resistant, but not waterproof. 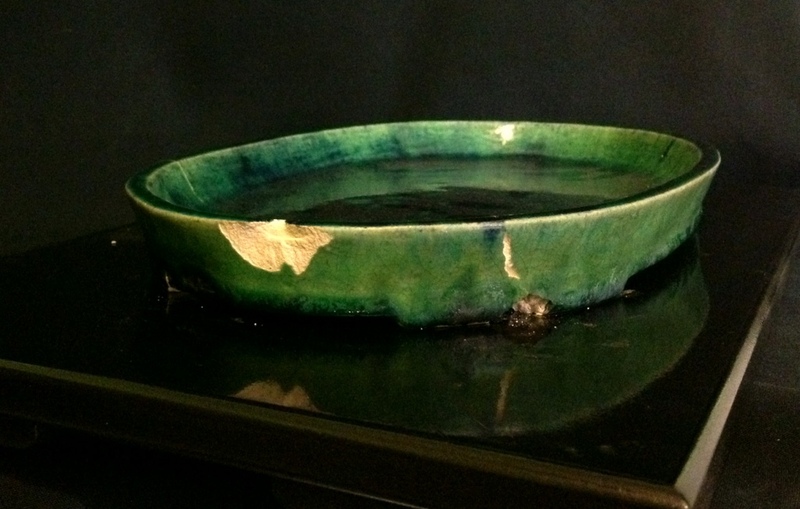 Lakeside Pottery repairs are also much better than the traditional Japanese lacquer repairs, as they use much stronger modern epoxies, but the appearance is still comparable to the original Style. In the interest of Full Disclosure, let me say that, while I was fully prepared to pay for this service, and had already contracted Lakeside Pottery to restore the suiban, Morty at Lakeside Pottery did not charge me for the repair. I discussed at length with Morty of Lakeside Pottery the options available for Kintsugi style repair and cost, and it wasnt until we had reached an agreement about the style of repair and materials that he informed me it would be Gratis. I would have written exactly the same article had I payed for the repair, as the work truly was exceptional. Very True, Sam. I hope so as well. With antique Chinese containers especially, it’s totally worth the time and cost. After 100 years or more of history, they deserve respect and 100 years more! Sick man! Looks like lightning! Ryan, I am interested in a pot that appeared on your site, the Sruga Yamsyou small basket weave mokko shape carved pot. Double stamped and signed, really awesome carving work. 3.5 by 3 by 1.1″ $400. 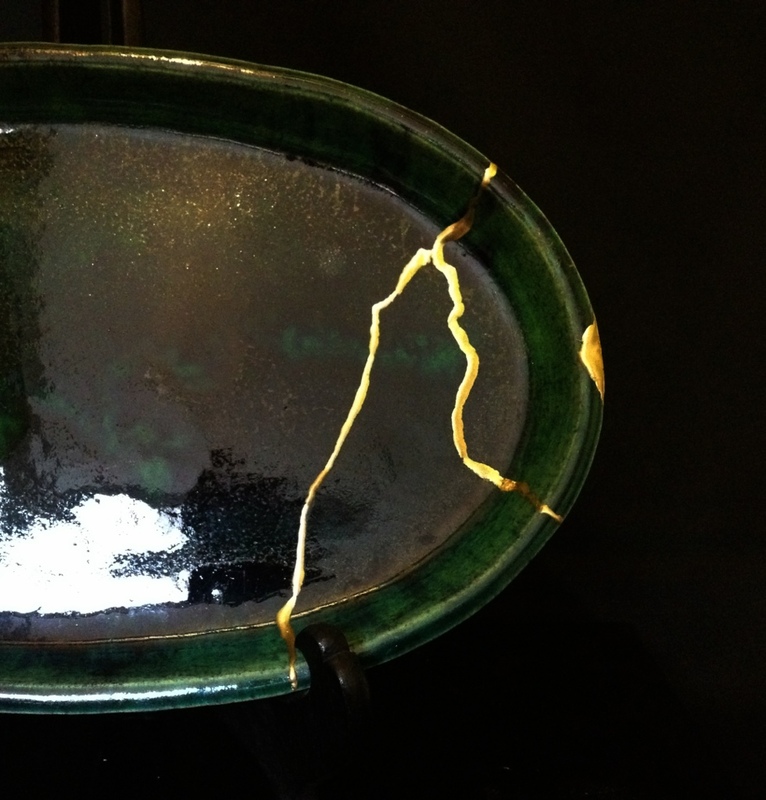 Even better after the golden repair, kintsugi bring so aesthetic value to things! I have same “problem” on a tosui suiban, handsigned suiban probably custom work, arrived damaged.. 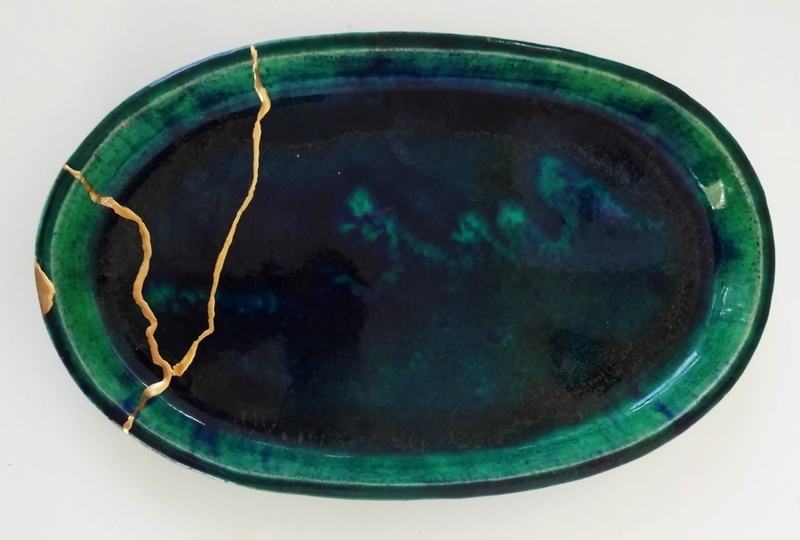 I bought japanese lacquer and started with kintsugi art. This will be my second repair, after a first tosui pot (not lucky with Tosui pots), then I will repair a very nice and old namban pot and a song period tenmoku bowl.